Content sounds ridiculously fun and easy but it’s actually one of the most challenging parts of managing marketing. Nearly every organization struggles with producing consistent high-quality content at some time. Story ideas for content, especially at social good organizations, are always plentiful but the time, expertise and energy it takes to create great content is tough. Fortunately, creating content is worth the extra effort. Companies who invest in content marketing experience the benefits. Even as little as two posts per month can generate an average of 100 new visits to your website (see Hubspot's’ 2017 benchmark data). Even with all of these fantastic benefits, it’s important to remember content takes time. Time to plan and carve out goals, time to create consistently, time to post online and time to track results. There are hundreds of reasons to start creating content. All that matters is that you choose one or two reasons that work for your organization. HINT: Your reason can’t be because everyone else is doing it. You need to have clear goals so you know if your content is actually doing its job and worth the investment. All of the reasons listed at the start of this article are solid. Just remember, any goal you choose should support your larger marketing and organizational goals. If you’ve never blogged before or it has been a while, start with a smaller goal like 2-3 articles per month. Once you get the hang of it, you can add more on but starting small in the beginning gives you a chance to work out the kinks of content creation. Are you looking to tell more stories about clients? Is thought leadership your goal? Or do you think how-tos and practical guides will be more impactful? Consider what’s doable for your team and what will resonate with your audience in light of your goals. If the sky’s the limit check out these 100+ ideas for content. Even if you don’t have all the answerings, this list should give you a good idea of what to keep in mind if you want to create content consistently. What tools do you already use regularly? 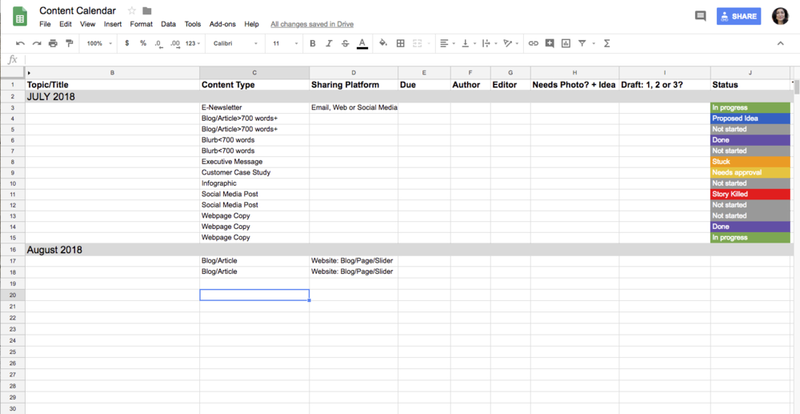 If you’re thinking a spreadsheet or Google sheet will work, then I’ve got a content calendar for you to try out. I created this to be general enough that you could cover just about all the basic content needs for your organization, plus I added a few conditioning rules to provide status updates. I adapted and customized this from a HubSpot content calendar. Check it out and let me know if you find it helpful. And here’s an extra link if you need more ideas on how to create or customize your content calendar. Holler if you have questions. I’m here to help! Older PostKey Messaging Guides: What are they, and do you really need one?